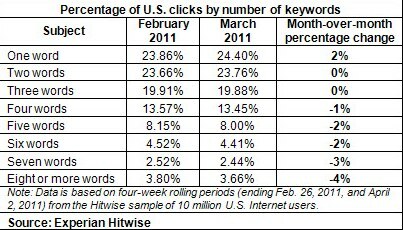 We cannot longer be ignoring Bing as a major competitor in the search market, at least when we are looking at the US that is. According to Hitwise Bing now has over 30% market share there. In the last month Bing gained almost 2% market share growing from 28.48% in February to 30.01% in March. It’s rival Google lost about the same share and went from 66.69% to 64.42%. Bing’s partner in crime Yahoo also so a rise: Yahoo powered searches went from 14.99% to 15.69%. We have to be careful with the numbers. Bing definitely is growing, and strongly, but the 30% is for Bing powered search, which means for example the searches within MSN, in toolbars, Yahoo, etcetera. Bing.com itself now account for 14.32%. So if you look at the stat below be sure to remember that. Still, Bing’s growth is good and the “alliance” certainly has the effect of becoming a real competitor. Is this the beginning of the end for Google? Is Bing going to catch them? 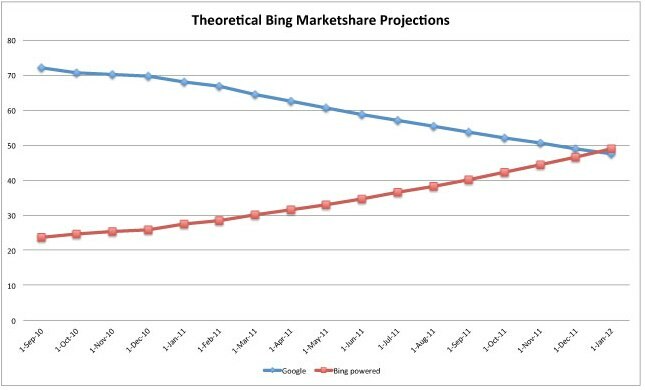 Mashable made an interesting chart suggesting that Bing might catch up with Google in 2012. It will probably not go that fast, but the rise is interesting enough to keep an eye on. Hitwise also looked at the search queries. Surprisingly enough the “One Word” search seems to be back, more people are searching for just one word, which can be seen by the 2% rise in one word searches. Two and three words are also still very much searched for, while the longer sentences clearly see a decrease. Chances are these are consequences of for example Google Instant.